The Church of St. Barbara arose at the place where the vice-governor Koudryavtsev's suburban house was located at the end of the 18th century. Tradition says that the suburban house of the vice-gover­nor Koudryavtsev was transformed into the church in 1779 or in 1780. On the one hand, at the church there was a churchly antimension dated in 1781. Nevertheless, on the other hand, in the pre-Revolutionary time the main altar kept the Evangel in the silver framework, that was marked with a hand-written record of the priest Iliya Fyodorov, who succeeded in establishing the church in 1764. The Church of St. Barbara was initial­ly a summer one (i.e. unheated). The winter (heated) temple was a side-chapel in honor of SS. Wives the Mirrhbearers. The Church of St. Barbara the Great Martyr was constructed for the needs of the Arsk cemetery. 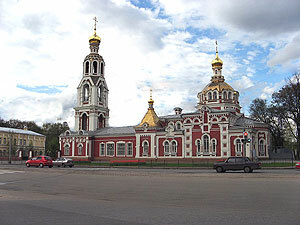 But in 1795 the cemetery church of the Miracle-Workers of Yaroslavl was erected, and so the Church of St. Barbara became a self-dependent parish one. Moreover, the cemetery church was under administration of the latter. The Church of St. Barbara underwent many reconstructions, and, therefore, it hardly preserved the initial frag­ments of construction. Designed in classical style, the main temple was disassembled and replaced with a new one built in tradition of Russian baroque by the project of the diocesan architect Fyodor Malinovsky. It was constructed from 1901 to 1907. The reconstruction works were conducted at the expense of the church itself, but the faithful made donations to the church either. In the 19th century the Church of St. Barbara was in the out­skirts of Kazan in front of Siberian Gates, the bridge of which was erected by the design of the architect Shelkovnikov in 1806. Many distin­guished persons visited the church and passed through the bridge at the different time. Those were Radischev (in 1790), Gertsen (in 1835), Tchernyshevsky (in 1864), Korolenko (in 1884). On February 2, 1864 Nikolay Baratynsky, the son of the famous Russian poet Eugenie Baratynsky and Olga Kazem-Beck, the daughter of the orientalist Kazem-Beck held the wed­ding ceremony at the Church of St. Barbara. On April 25, 1903 Nicholai Zabolotsky (to be the famous poet) was baptized. When a teenager, Fyodor Shalyapin used to sing in choir in the Church of St. Barbara. Nicholai Petrov was the last dean of the church from 1918 to 1930. Simultaneously he was the professor both of the Theological Academy of Kazan and the University of Kazan (from 1914 to 1918), as well as the principal of the Theologic University of Kazan (from 1921 to 1923). On January 26, 1930 the archpriest Nicholai Petrov was arrested and exiled. In Soviet time the building of the church was converted into the Cinema Theater, a prosthetic work­shop, etc. 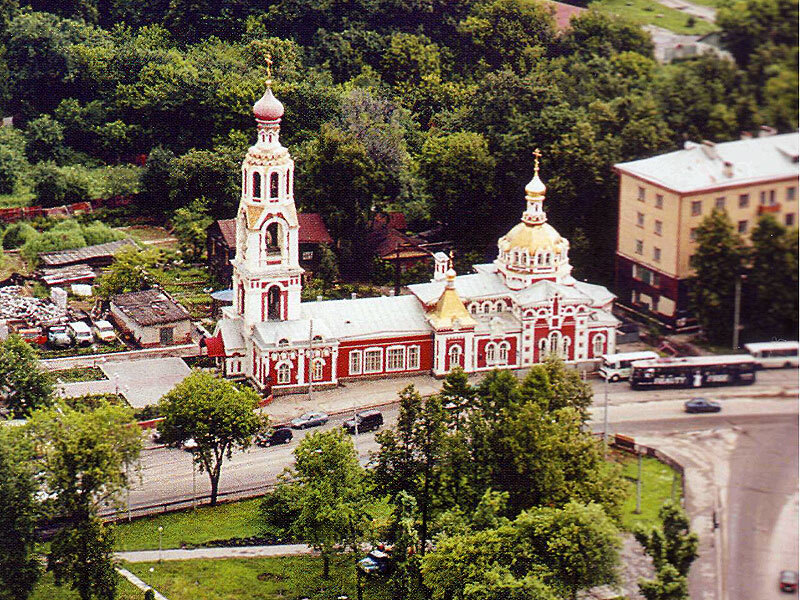 In 1994 at the urgent requests of the faithful the Church of St. Barbara was returned to the Orthodox Church. The icons of St. Barbara the Great Martyr and SS. Wives the Mirrh-bearers were brought from the Church of SS. Miracle-Workers of Yaroslavl to the Church of St. Barbara. By 2000 the Church underwent restoration works: cupolas had been restored and gilded, crosses had been fixed, a marble floor had been laid in the church, instead of a ramshackle ceiling of the central part (i.e. nave) of the church building which was ready to fall in a new one had been erected. At present, the icon screen of the church is being repaired. The archpriest Vitalius Timofeev initiated reestablishment and restoration works with the help of benefactors of Kazan. Archpriest Vitaly Timofeev is a rector. Clergy: priest Mikhail Ganin, priest Vladimir Ponomarev, priest Dimitry Tsyplakov. Divine services are performed on Friday and on Saturday, on this days Liturgy begins at 8.00. On Sundays and on Feast days early Liturgy begins at 6.30 and late Liturgy at 8.30, Evening service is conducted overnight at 16.00.